From wood shutters to vinyl shutters, we offer a wide selection of louvre sizes, colours and other options to suit your home decor needs across GTA and surrounding areas. Designer shutters increase your home's value while also reducing energy consumption - keeping you cool on those blistering hot summer days and warmer for those winter nights. 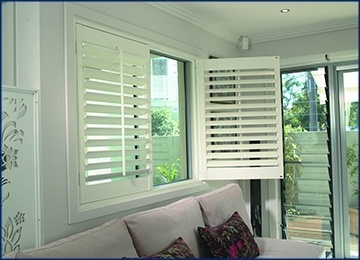 We also offer shutters for specialty windows from sunbursts to bay and bow windows. Shutters available in vinyl or wood finish. 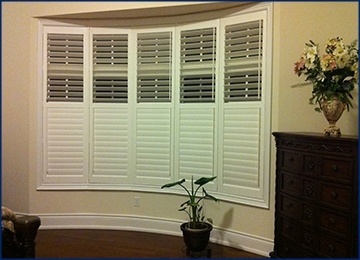 Our vinyl shutters are made from durable, long-lasting materials manufactured here in Ontario, Canada. Coming in either white or beige to match your window frames. You can also choose from a number of frame options, dividers and style-rod placements to perfect the look you want in your shutters. Sunburst and arched windows can also be fashioned in vinyl. 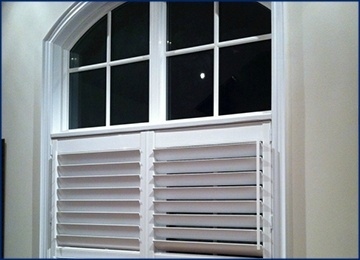 Vinyl shutters are water resistant making them great for any window in your home. They're backed by our lifetime warranty in the case of any concerns. Wood shutters add a timely classic look to your home. Our wood shutters are made from some of the finest wood, ranging from American Yellow Poplar to Oak and Pine. Customize your wood shutters with over a dozen colour stains. Sunburst and arched windows can also be fashioned in wood. Wood shutters don't do well in moisture, which is why we don't recommend wood shutters in bathrooms or above kitchen sinks.